Sales people have had automation for a long time but the traditional form of automation aligned with the traditional view of the sales job. It was “phone automation”. It took the form of auto dialers and click-to-dial solutions. But now email has become an incredibly popular sales tool (maybe too popular but that’s a discussion for a different post.) Prospecting by email is the norm these days. I’ve written a lot before about how to improve the quality of prospecting emails but driving sales requires a certain quantity of emails as well. There is a natural tension between quality and quantity. It takes time to research the information you need to construct the kind of prospecting email I suggest. When you break down such an email you see there are several points that are customized to that individual email. Doing this research and then incorporating it into an email can take a while. I’d say maybe 15 mins per email from my experience of banging these out at various times in my sales career. 15 minutes times 10 emails is 150 minutes or 2.5 hours. In a typical selling day other things interrupt. A prospect calls with a question. A client calls with a problem. Your Sales VP needs a report immediately for your CEO. Even if you “build a fort” around your prospecting time there’s a great chance you won’t get through more than 2.5 hours of this kind of work in a day. Let’s say 3 out of 5 days in your week you get 10 quality prospecting emails out. So that’s 30 emails in a week. Now given these are “quality” emails my experience is you may get 3-4 conversations from these (maybe up to 5-6). Will that be enough to drive the leads you need to hit quota? Another approach to this problem is to blast out a large quantity of emails that are less customized. These lower quality emails (my opinion) can be automated and blasted out in their hundreds or thousands. My experience is you may only get a 1 in 500 or 1 in 1,000 response on these but because they are automated if you get 5,000 out in a week you may hit the same number as the “high quality approach”. OK so the math above can certainly be argued over. I’ve never seen a study that compares the two approaches but would love to. If you’ve seen one please let me know. But what if there was a third option? Something in the middle? Something that combined higher quality with greater quantity. Could such a solution 10 x your conversation rate rate? That’s what a company called Sendbloom is working on. 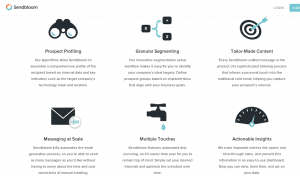 Sendbloom is a “sales automation” tool. It helps a sales person produce customized emails that can also be sent out in volume. Right now the level of customization does not cover all the elements I want to see in my social selling type emails but the potential is there. The tool can also do the “traditional” marketing automation type tasks of sending a sequence of follow up emails to prospects that do not reply (that would be most even with my fancy social selling email approach.) Bunches of time saved. 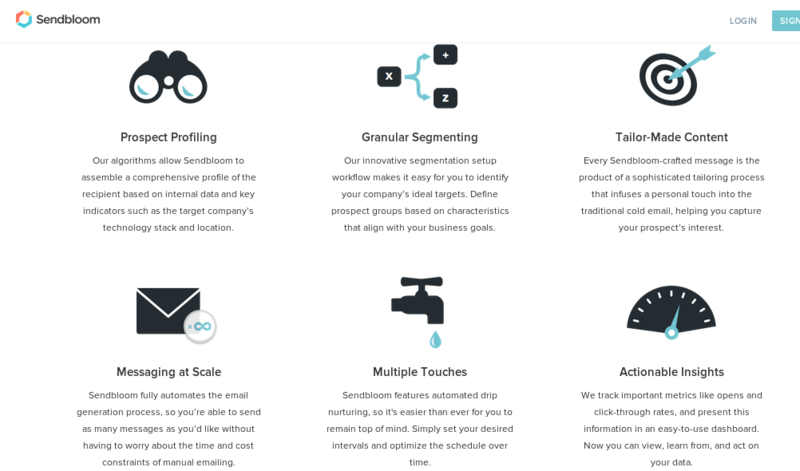 I’d like to see a tool like Sendbloom integrate the prospecting components that I’ve found are most effective in helping you get in the door: a mutual friend and a trigger event. It can’t currently do that but talking to the company’s CEO, Ross Epstein, he understands the need and could include these concepts down the road. The company is young but is already getting some good results with early adopters like Optimizely. In the Optimizely case the company’s inside sales team is saving a bunch of time writing emails and spending more time talking to the leads generated. Marketing departments have some pretty sophisticated automation tools already (like Marketo, Hubspot and Silverpop). These tools do something similar to the functions Sendbloom delivers. 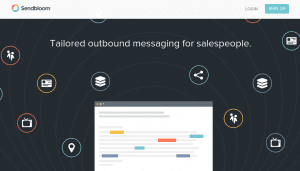 Could these tools be adapted to fit the needs of sales people? Almost certainly. Will they? We will see. I’ve spent dozens of hours in the last few years researching and building social selling emails. If I had an “automated assistant” that could bang these out 100 to 1,000 times faster I would be a very happy camper. We’re not there yet but clearly we’re working the problem. When it’s finally possible that will be a “blooming” good day.